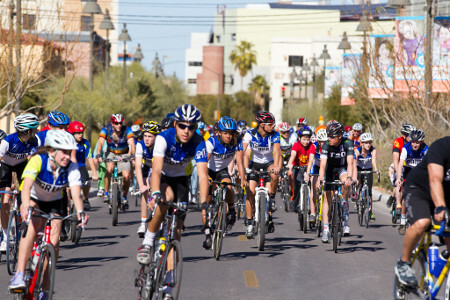 Pima County Department of Transportation’s Bicycle and Pedestrian Program is involved with a couple of key events related to El Tour de Tucson, the cycling event in its 33rd year that’s expected to draw some 9,000 riders to the area Nov. 21. Jr. El Tour, in its ninth year, was created to help children ages 10-12 struggling with issues such as obesity, learning disabilities or poverty take a step toward better health. Pima County bike ambassadors help the students train for three months leading up to El Tour and ride with the students on the 40-mile leg of the ride. Bike ambassadors are cycling advocates who are on contract with the county to run various bike safety and education programs. Scott Blanchard, the Jr. El Tour founder, said about 30 students are competing this year. They will ride with about 10 student mentors who took part in the ride in previous years and about 30 coaches and other adults. Students who continue riding and training with Jr. El Tour after the race can keep the helmets, bikes and other safety gear that Pima County helps provide. Much of the training the riders and bike ambassadors do before and after El Tour de Tucson takes place on The Loop. Students at three Tucson schools have been getting into the spirit of El Tour de Tucson, many without ever leaving school grounds. Elaine Mariolle, who manages the middle school bike safety programs for Pima County and is public affairs and education director at Perimeter Cycling, which organizes the race, said students have been riding stationary bikes through their physical education classes to rack up miles and minutes in the spirit of El Tour. Schools taking part are in the “Indoor El Tour” are: Dietz K-8 School, 7575 E. Palma St., in the Tucson Unified School District; Lauffer Middle School, 5385 E. Littletown Road; and Desert View High School, 4101 E. Valencia. The latter two are in the Sunnyside Unified School District. Dietz students conclude their indoor riding today (Wednesday, Nov. 18), but Lauffer and Desert View students will be pedaling until Friday.